Brian Clussman has always had concrete goals and plans for success in the RTO industry. He was with Remco/Rent A Center for over 16 years and grew both personally and professionally with leaders like Fred Mattox and Jeff White. Beginning as a management trainee in San Antonio, TX in 1990, his first store manager opportunity moved him to Buffalo, NY in 1992. From there he managed his way back to San Antonio and ran a very successful market for RAC. He was promoted to Regional Director in 2003 and moved to California, and then Arizona. 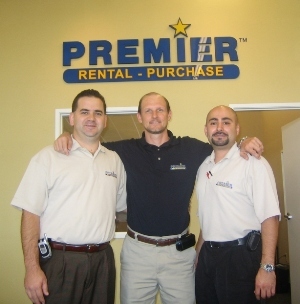 In 2006, he decided that it was time to be his own boss and open a Premier Rental-Purchase store in San Antonio, TX. "I know how to make money within the guidelines that a company gives you," he says when asked about his strengths. "I am also very relationship driven. I like people and always live by the Golden Rule. As long as you believe in what you're doing and treat people with great respect, everyone wins." Brian had been thinking for many years of going out on his own and had seen many of his friends and peers do so through the years. He tried obtaining a Renters Choice franchise in San Antonio and also went the route of an independent but was road blocked on each occasion for one reason or another. Brian knew about Premier and learned that they were an SBA preferred lender. Not unlike many aspiring business owners, Brian had previously found that banks were always the hurdle. But Premier had an "in" with the SBA. Brian had met Premier's president/CEO, Trooper Earle, on one occasion and also knew a couple of Premier franchisees, including Trini Rubio in San Antonio. He added it all up and decided it would be much more feasible to "use someone who could leverage their name with banks and the SBA." Thus, a new Premier Rental-Purchase franchise was born. Brian also found Premier's support systems were good, and Premier's franchising plan beat trying to gather information and piece it all together. Also, Brian could maintain the flexibility as a true entrepreneur. Trini, who enjoys realizing his expectations in his first store, is quick to say that Premier made a big difference for him when he first went into business. And now his success and experience along with Premier's continued support is helping to pave the way for Brian's new store. Trini and Brian are looking toward the future with great anticipation and have forged a terrific partnership together, both as friends and collaborators. "I owe a lot of my success to Premier. They opened doors for me," says Trini, who adds that as a Premier dealer he has a lot of things available to him that he wouldn't have on his own. "My familiarity with the process made it easier for Brian to get up and running." Brian's new store is located at 509 Fair Ave., San Antonio, TX 78223. The phone number is 210-533-7368. Hours are Mon-Fri 10-7 and Saturday 9-6. The national office of Premier Rental Purchase is located in Williamsburg, VA. All Premier stores are independently owned and operated. Visit Premier's website at www.premierrents.net or call 1-800-2Premier and ask for Trooper Earle. Congratulations to Bart Stamper on his second Premier Rental-Purchase store!